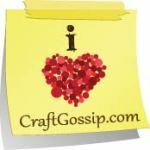 Learn the Secrets to Making Money while Staying Passionate about your Art and Craft that you will L.O.V.E! Oh and a fun video from the author Lilla Rogers! First up check out this inside peek of Lilla's studio and world. 1. Follow my "Groovy Granny's Junk Shop" board on Pinterest. 2. Create your own Groovy Granny's Junk Shop board on Pinterest. 3. Pin the below image from Lilla's book along with 10 random pictures of things that you would buy/find to create something awesome. At least two things have to be from my Pinterest board. 4. Copy/paste the URL to your Pinterest board here in the comments section by midnight on March 5th, 2013. 5. I'll randomly pick a winner and send you a copy of Lilla's amazing book, I Just Like to Make Things. Along with the 4 options Lilla suggests, I have a few of my own to come up with 10 random things to combine to make something. - How about going through your "junk drawer"? Don't we all have one usually in the kitchen filled with all sorts of stuff. - I don't know about you, but sometimes I need to clean off my creative work space quick and I "broom" it all off into a box. It doesn't get sorted and the bits don't make it back where they belong. Why not try making something with all the items in that box? - Clean out your jewelry box. Take all the pieces you haven't worn in a while and "rebuild" them into a new piece. Lilla Rogers was a full-time, highly successful illustrator beginning in 1984 with clients ranging from theNew York Times, Takishamaya, Barneys New York, and Levi’s. She had agents in Tokyo, Paris, and New York. In 1994 her top students asked her to represent them. Since that time, Lilla Rogers Studio has become one of the most respected illustration agencies in the US, with clients in Europe and Asia and known for setting trend. Being an illustrator and teacher allows Lilla the unique position of helping her artists grow as she fully understands the creative process and how to nurture the best in each artist. She has lectured internationally at conferences and trade shows, such as the Illustration Conference (ICON) and PrintsourceNewYork, colleges and corporations, and is interviewed for her expertise as an agent, trendsetter, and artist. She lives in Arlington, MA. Visit her online at http://www.lillarogers.com. I bet each and every one of you has experienced a "where do I start" moment in your crafting. Well,here is a whole page from the book I Just Like to Make Things: Learn the Secrets to Making Money while Staying Passionate about your Art and Craft of great ideas to create rituals that get you into the "zone". Click on this page from I Just Like to Make Things: Learn the Secrets to Making Money while Staying Passionate about your Art and Craft to enlarge and read all about how to create rituals that get your creativity flowing.